GARDENA, Calif. – January 8, 2017 – The Carroll Shelby Foundation will auction the prototype 2008 Ford Shelby GT convertible (Lot #1012) on January 19, 2018, at the 47th Annual Barrett-Jackson Scottsdale Auction. The car, (CSM08SGT0003P) is also the prototype for the first retail Shelby built Mustang-based convertible since 1970. Aaron Shelby, Co-President of the Carroll Shelby Foundation will drive the car onto the auction block, a decade after his grandfather, Carroll Shelby, piloted it for press activities. In 2007, Ford Division, Carroll Shelby and Ford Racing joined forces to create a retail version of The Hertz Corporation Shelby GT-H coupe called the Ford Shelby GT. All 2007 Shelby GTs were coupes and only available painted white or black. 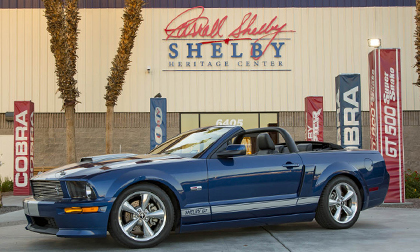 The duo of Ford and Carroll Shelby brought open-air excitement to the road for the 2008 model year as the Shelby GT returned with a new convertible body style and a new standard color combination. Like all Shelby models, production was limited to assure exclusivity for collectors. Each Shelby GT began life as a specially-equipped Mustang GT assembled at the AutoAlliance International assembly plant in Flat Rock, Michigan. The cars were shipped to the Shelby Automobiles facility in Las Vegas for transformation before delivery to Ford dealerships nationwide. Shelby added key aerodynamic enhancements, a Ford Racing Power Upgrade Package to pump up the horsepower and torque, Hurst short-throw shifter, sport tuned suspension and 18” tires. Each car featured an authentication plate on the dash, as well as a matching tag under the hood for documentation in the official registry. Only 2,214 total 2008 Shelby GT coupes and convertibles were built. This blue with silver striped Shelby was the company’s official press car. It was photographed for all media photos, which were distributed worldwide and appeared in every initial article about the Shelby GT convertible that year. Personally driven by Carroll Shelby for promotional purposes, the car starred in stories published by major automotive outlets such as Motor Trend, Road & Track, AutoWeek, Car & Driver, Automobile and Mustang Monthly. The 2008 Shelby GT owned by the Carroll Shelby Foundation is scheduled to cross the Barrett-Jackson Auction block on Friday, January 19, 2018, between 1:30 and 3:30 pm central mountain time.